WE ARE PROUD OF THE GREAT TRUST! No one else organizes so many wedding events like we do! It's easy to check it by visit our website section Portfolio. If you think you know a cool yet futuristic wedding these days, you need to check these Robot that involve in a romantic celebration of love! 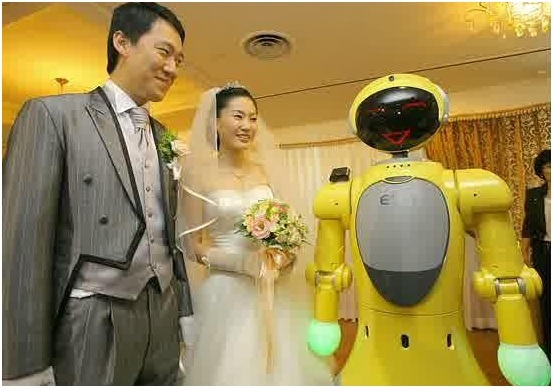 In Japan there are couple getting married and lead by a Robot Celebrant called i-Fairy in Tokyo! The unique way of choosing a celebrant starts because the bride and groom work in a robotic company together so no wonder they found this extra ordinary celebrant. The other reason was they were keen to showcase of a new android generation these days. The wedding held in a restaurant in Hibiya Park, Tokyo, where the I-Fairy wore a wreath of flowers in her/his head. The groom Tomohiro Shibata is a professor of robotics at the Japanese Nara Institute of Science and Technology. The bride said that Japan is so familiar with Robot, and seems like Japan known as a best robot inventor, that’s why they wanted to embrace this to the world throughout their special wedding day! This service do not come cheap of course, it costs $76,000 for just the robot, you could either buy a house, or have your wedding lead by the i-Fairy robot. It is expensive, but a wedding is a sacred ceremony and will be a night that you’ll remember forever, so might as well go all out right? A mechanical engineer by the name of Née Wong helped design the Dragon Runner’s robotic arm and she able to borrow the robot from the place she worked at. The robot serves as the couple’s ring bearer on her wedding day , complete with miniature dress shirt and tuxedo vest. 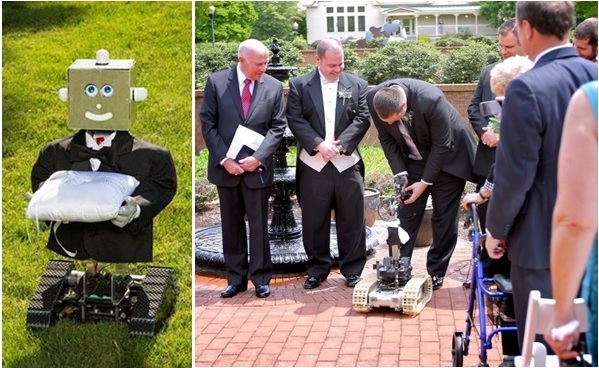 The Dragon Runner, a military robot, acted as the ring bearer at Laura Cressman's wedding. I think this is a nice way of thingking for the future that robot can be a perfect ring bearer, he will do what we planned him to do and he won’t change his mind while walking down the aisle like most ring bearer do in a sad wedding movies! The Cressmans were not the first couple to have their wedding helped under the watchful gaze of a robot. In 2007, a bumblebee-yellow robot named "Tiro" as a master of ceremony for a South Korean couple, introducing the newlyweds to the crowd in a male voice with a smile on his dark, glassy face. At the time, Tiro was valued at 200 million won, or roughly $189,000. Much higher than the i-Fairy robot in japan. Just take a look at the 'Tiro.' This robot played the role of master of ceremonies at the civil wedding ceremony for Seok Gyeong-Jae at Daejeon, 130 kilometres (78 miles) south of Seoul. Moreover, Tiro was accompanied by some other robots at the wedding who took care of the guests and gave live performances. This is such an interesting wedding! The use of a robot as the master of ceremonies at a wedding happened for the very first time in the history of robots. So, robots are becoming a trend these days and people really love to spend money on such expensive priced robots, otherwise why will so many companies just put them into production? Rainy season in Bali: not a problem! Go on wedding venue inspection with us!